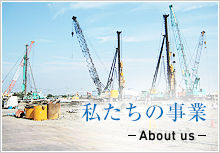 Probabiy little known elsewhere, precast nodular piles have been in use for more than six deoades in Japan. Over the years, reinforced concrete noduiar piles of rectangular, trlangular, hexagonal and circular cross sections have been used. In recent years, prestressed precast high strength concrete (PHC) nodular piles of circular cross section have been common. The diameter (Da) of pile shaft is relatively smali, while the nodal diameter (D) generally varies from 1.25 to 1.40 times Da. High strength concrete of grade 80MPa or 85MPa and effective prestress levels of 4MPa, 8MPa or 10MPa are used depending on the type classification conforming to the JIS specification. The PHC nodular piles are generally used to support low to medium-rise buildings at locations with deep soil deposit, where the competent bearing stratum is very deep. Thus the pfies are embedded in relatively soft surncial deposits, and a major portion of the vertical resistance is derived from shaft resistance. In this sense, the PHC nodular piles are commonly referred to as friction piies.